Make a do it yourself nursery switch plate to match your nursery theme! Decorative switchplates are a wonderful addition to any child's room. With our quick and easy craft instructions, you can personalize a clear plastic nursery switchplate with family photos, wallpaper or your own unique style of art. A personalized nursery switch plate is just another way to join all of the aspects of your nursery's decor together into one complimentary design. With the right pictures, this inexpensive decorative accessory would make a really cool shower gift idea. If your decorative nursery switchplate is a gift for a friend make sure that you know the colors in her nursery or "borrow" some wallpaper or photographs so that your gift will coordinate with the theme of her child's room. 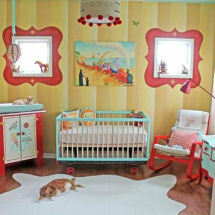 designer wallpaper or any decorative image you can use in your baby's nursery theme. Once your design is applied either with your printable, stencil or free hand artwork cover the plate with clear contact paper, trim the edges and you now have your custom personalized piece of nursery theme art! This will work for all wall light switches and electrical outlets. It does not matter if they are single, double or triple face switch plates, just be very careful when cutting the slots for the switches.